Two hundred students of class VI and VII were asked to name their favourite colours so as to decide upon what should be the colour of their school house. The results are shown in the following table. 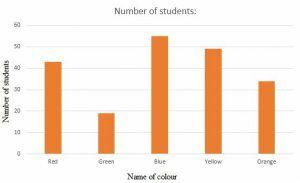 Represent the given data on a bar graph. (i) Which is the most preferred colour and which is the least? (ii) How many colours are there in all? Mark the horizontal axis OX as “Name of the Colour” and the vertical axis OY as “Number Of Students”. Along the horizontal axis OX, choose bars of uniform (equal) width, with a uniform gap between them. Choose a suitable scale to determine the heights of the bars, according to the space available for the graph. Here, we choose 1 small division to represent 10 students. (i) The most preferred colour is blue and the least preferred is green. (ii) In all, there are 5 colours. 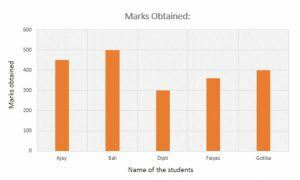 Following data gives total marks (out of 600) obtained by six children of a particular class. Mark the horizontal axis OX as “Name of the Students” and the vertical axis OY as “Marks Obtained”. Choose a suitable scale to determine the heights of the bars, according to the space available for the graph. Here, we choose 1 small division to represent 100 marks. (i) How do you choose the scale. 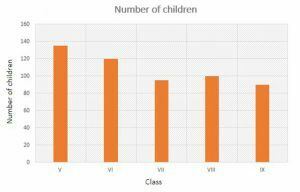 (ii) Which class has the maximum number of children? (iii) Which class has the minimum number of children? Mark the horizontal axis OX as “Class” and the vertical axis OY as “Number of Children”. Choose a suitable scale to determine the heights of the bars, according to the space available for the graph. Here, we choose 1 big division to represent 40 children. (i) We choose 1 big to represent 40 children. (ii)The maximum numbers of students are in class V.
(iii) The minimum number of students are in class X. (i) In which subject, has the children improved their performance the most? (ii) Has the performance gone down in any subject? We choose 1 small division to represent 1 child in the graph. Mark the horizontal axis OX as “Subject” and the vertical axis OY as “Marks”. Choose a suitable scale to determine the heights of the bars, according to the space available for the graph. Here, we choose 1 big division to represent 10 marks. (i) In Maths, the students showed their greatest improvement. (ii) The students performed worst in Hindi. Draw a double bar graph choosing an appropriate scale. What do you infer from the bar graph? (i) Which sport is most popular? 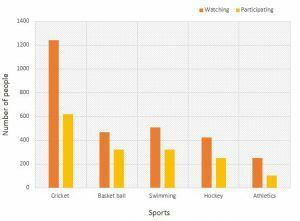 (ii) What is more preferred watching or participating in sports? Mark the horizontal axis OX as “Favourite Sports” and the vertical axis OY as “Number of People”. Choose a suitable scale to determine the heights of the bars, according to the space available for the graph. Here, we choose 2 big divisions to represent 400 people. (1) Cricket is the most popular sport. (ii)Watching is preferred over participation. Construct a bar graph to represent the above data on a graph paper by using the scale 1 big division=20 thousand tonnes. Mark the horizontal axis OX as “Name of the Steel Plant” and the vertical axis OY as Production (in thousand tonnes)”. Choose a suitable scale to determine the heights of the bars, according to the space available for the graph. Here, we choose 1 big division to represent 20 thousand tonnes. Construct a bar graph to represent the above data. 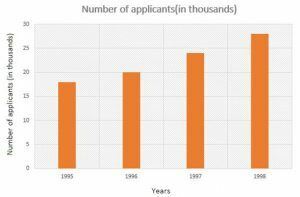 Mark the horizontal axis OX as “Years” and the vertical axis OY as “Number of Applicants Registered (in thousands)”. Choose a suitable scale to determine the heights of the bars, according to the space available for the graph. Here, we choose 1 big division to represent 4 thousand applicants. 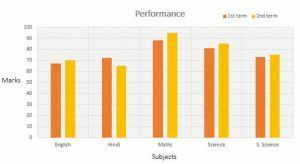 Represent the above data with the help of a bar graph. 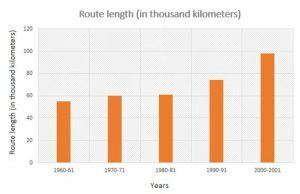 Mark the horizontal axis OX as “Years” and the vertical axis OY as “Route Length (in thousand kilometres)”. Choose a suitable scale to determine the heights of the bars, according to the space available for the graph. Here, we choose 1 big division to represent 1000 Km. (i) Represent the above data with the help of a bar graph. (ii) With the help of the bar graph, indicate the year in which amount of loan is not increased over that of the preceding year. Mark the horizontal axis OX as “Years” and the vertical axis OY as “Loan (in crores of rupees)”. Choose a suitable scale to determine the heights of the bars, according to the space available for the graph. Here, we choose 1 big division to represent 10 crores of rupees. 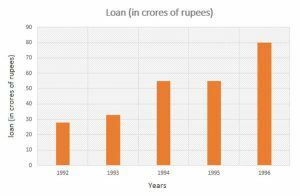 In 1995, the loan amount was not increased over that of the preceding year. Draw the bar graph to represent the above information. 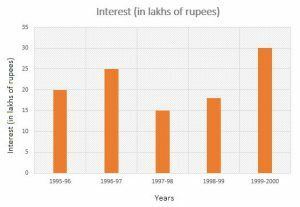 Mark the horizontal axis OX as “Years” and the vertical axis OY as “Interest (in lakhs of rupees)”. Choose a suitable scale to determine the heights of the bars, according to the space available for the graph. Here, we choose 1 big divisions to represent 5 lakhs rupees. Represent the above information by a bar graph. 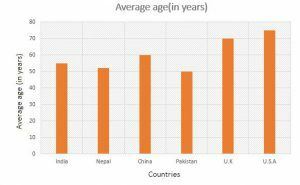 Mark the horizontal axis OX as “Countries” and the vertical axis OY as “Average Age of men (in years)”. Choose a suitable scale to determine the heights of the bars, according to the space available for the graph. Here, we choose 1 big division to represent 10 year. 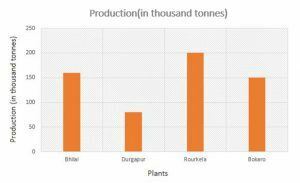 Mark the horizontal axis OX as “Years” and the vertical axis OY as “Production of foodgrains (in thousand tonnes)”. 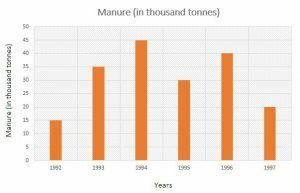 (ii) Indicate with the help of the bar graph the year in which the amount of manure manufactured by the company was maximum. Mark the horizontal axis OX as “Years” and the vertical axis OY as “Manure (in thousand tonnes)”. Choose a suitable scale to determine the heights of the bars, according to the space available for the graph. Here, we choose 1 big division to represent 5 thousand tonnes. 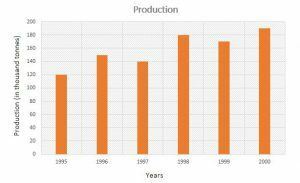 (ii) In the year 1994, the amount of manure manufactured by the company was maximum.